On May 5, 2002, Marie and Fritz took off from San Francisco for three weeks of visiting in various regions of France. We had visited Paris on a number of occasions (Fritz once lived there) but this time we wanted to see what life was like in the rest of France. We landed at Charles de Gaulle airport on Sunday morning and picked up a rental car from Avis, and a rental call phone from Call'Phone. The car was a diesel Renault Scénic which was comfortable and roomy and got good gas mileage. We found out that diesel (often called gazoil at the pump) sells for up to 25% less than gasoline in France. At the large markets ("Grands Surfaces") it sold for around €0.74 a liter compared to €1.05 for gasoline. That's $2.63 a gallon vs. $3.73 a gallon. The cell phone was an easy way to call hotels and guest rooms as we came into an area. It also allowed us to keep in touch with the States and be reachable in case of emergency. "Gallia est omnis divisa in partes tres." (All Gaul is divided in three parts.) That's how Julius Caesar began his classic description of the wars which brought most of Northern Europe under Roman rule. 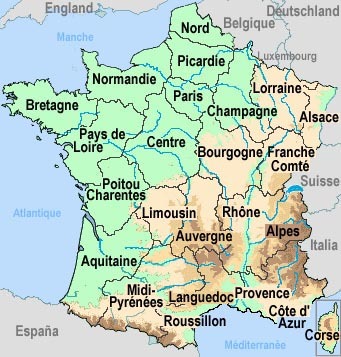 Today, France is divided into 22 regions. One fifth of the population and over half of the industrial base is in the area immediately around Paris. The rest is agricultural and light industry with a few exceptions. Our trip took us west from Paris through Normandy and Brittany, then south through the Aquitaine as far as the Pyrenees, then back up to the Loire valley and the center of France before returning to Paris for our trip home. We left all of eastern France for another trip. Click here (or on Itinerary button at the top of the page) to see our trip and the pictures we took. The pictures are represented by small versions called "Thumbnails" to speed up the loading of the pages. To see the full high resolution image, click on the thumbnail. To then return to the web site, use the "Back" button of your browser.